(Newser) – All is not well in cranberry country this harvesting season, the 200th anniversary of the world's first known commercial cultivation, the AP reports. In the birthplace of the industry, many Massachusetts growers whose families have tended bogs for generations are in dire straits, facing challenges that include rising production costs, decreasing crop values, changing consumer habits, and increasing competition from other states and Canada, a recent task force report found. In addition, one of the region's worst droughts in decades threatens to leave farms without enough water to flood bogs for harvest. Revolutionary War veteran Henry Hall is credited with starting commercial cranberry production on Cape Cod in 1816. The fruit remains Massachusetts' top food crop, supporting thousands of jobs and generating $1.4 billion in economic activity. 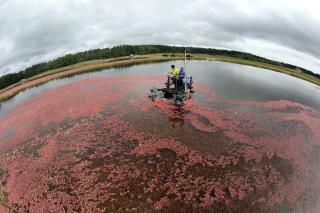 Cranberries are a coastal crop here. They are a hoot and a half to harvest with these "Steam Punk" beaters that look like they got stolen off a paddle wheel river boat. Land is getting expensive for almost all crops now, as flat land is a developers' favorite land. What you buy in the grocery store is mostly high fructose corn syrup and dyes. When I do buy cranberry drink, I get it at Whole Foods and its all juice with no additives. That's the best for kidney and bladder health.